Fun with a capital Z? 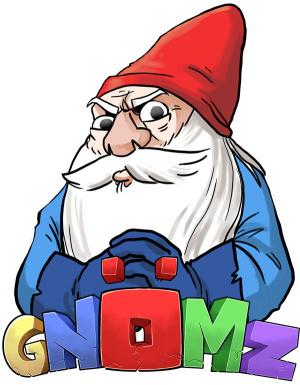 When we first started playing Gnomz, we were excited: here's a game that's joyously silly, bizarre and simple enough that anyone willing to pick up the controller could play it and have an absolute blast. 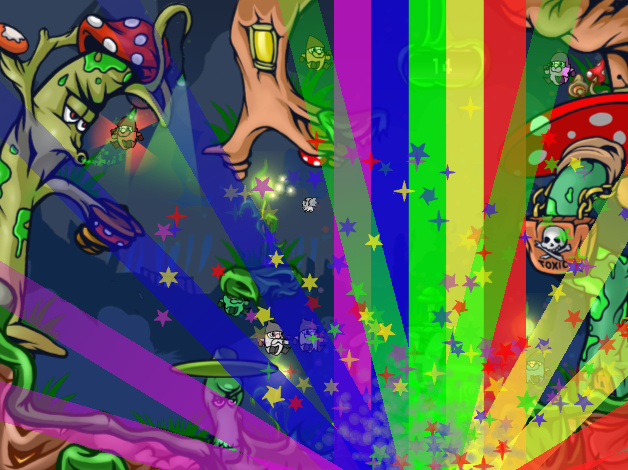 The graphics are colourful. The soundtrack has a giddy urgency to it. It's got a good sense of humour. 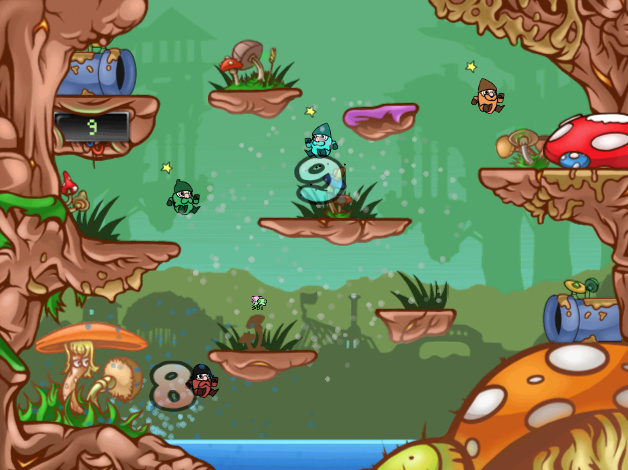 WiiWare's Angry Birds? Possibly. As it turns out, Gnomz is strikingly similar to copyright-infringing fan game Super Mario War; a mixture of the original Mario Bros. arcade game, Super Smash Bros. and just a pinch of the colourful weirdness of Daisuke “Pixel” Amaya's bizarre early experiments like Glasses. The matches take place on a single stage — think Super Mario Bros. with fewer baddies and more obstacles — and the goal is simply to hop on your opponents' heads more times then they hop on yours. That's all; just jump on those heads. Except of course there's up to six gnomes on the stage at any given time, the bonkers power-ups of Super Smash Bros. Brawl, springs, traps and other mess-you-upperies. In a word: it's chaos, and at times, it's beautiful chaos. You can even customise time and stock options as well, speaking of Brawl. Gnomz does grab its gameplay from a stack of sources, but it ultimately does have its own vibe. It's fun, but not in a nostalgic way as is SMW — Gnomz is wacky, like a WarioWare microgame stretched to a whole game. Unoriginal, yes, but not without its charms. It's not a bad looking game either, as you've probably noticed from the screenshots by now. 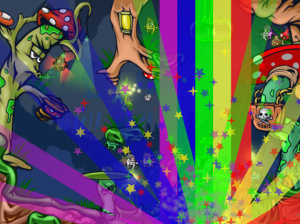 Those gnomes, and the levels where the game takes place have an appealing and colourful hand-drawn look about them, although unfortunately the levels and characters have a stagnancy that at times causes you to feel like you are, in fact, just interacting with colourful screenshots. But of course when you end your game's name with a Z and you're not MotoHeroz, one assumes you're not aiming for high art. 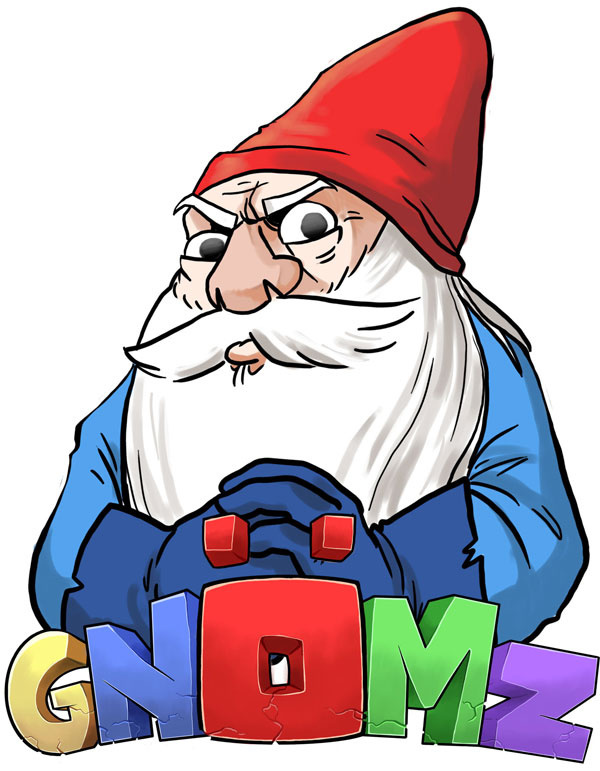 What Gnomz is aiming for is pick-up-and play, charming, family-friendly fun, and at this it succeeds. There's only one button in play here — that'd be the 2 button to jump — meaning that anyone willing to pick up the controller, even Mom and Dad, will be able to enjoy the chaos in no time. They'll even be treated to a couple variations of the main brawl mode, though their mileage may vary. Socker has you collecting as many socks as possible within a pre-set time limit; if you like this sort of thing, you'll like Socker. Capture the Sock is probably the weakest of the game modes, recalling the King of the Hill multiplayer mode from Tony Hawk's Pro Skater 3, but not as well-balanced, and in more cramped surroundings. All this sounds well and good, but does it sound 1000 Points good? 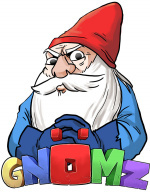 It's priced right at the tip of its value, and while we would have preferred 800 Points or less, you might want to download Gnomz if you're looking for something accessible and fun that you can play with your whole family — not because you're looking for something original. I love the look of this game and it sounds really fun, but you nailed it in the conclusion. The price is just a little too high and I am gonna pass on it because of that. It's really a shame Nintendo doesn't let developers set their own price. But you would have spare points when it costs less than 1000... And yes, i'm being cynical here. I think this game is cute and super sick!!!!!!! The game may get a 6/10, but that tagline is a solid 9. No, this game is nothing for me. It's the kind of game that I wouldn't want, even if they tried to give it to me for free. It's a somewhat tepid recommendation, but the game really does get more fun the more you play it. If you really payed 1000 points for it, I'd play a few games before completely dismissing it. Yeah, I paid for it. I buy this along with "MotoHeroz (1500 Points)", "escapeVektor Chapter 1 (500 Points)" and "Horizon Riders (800 Points)". I try to play it a couple of times, but it just doesn’t work for me. I don’t recommend it since its more expensive than 2 of the other games I got at the same time and it’s not even the half of good or fun than any of the three I mentioned before. This looks fairly decent, I don't want anything to do with it though. I bet I would really enjoy this game, but I do not have anyone to play with around here. If this had online multiplayer, I probably would snag it. Played the demo last night - this game is Joust without the irritating continual button mashing. How you managed to get thru an entire review without mentioning Joust is beyond me. 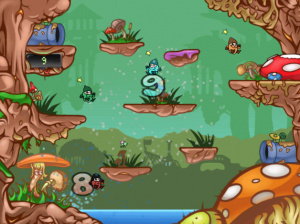 It also graphically reminds me a lot of Worms: Armageddon, though not as quirky. If you dropped an old Joust Atari arcade cabinet from the 80's onto your Wii and gave it a double expresso you'ld have Gnomz. The only difference between this and Joust is Joust was a little more horizontal and this is little more vertical, but it is Joust. Wow I had never heard of this game. I got here from the Nintendo Download March 29th page. This game actually looks like tons of fun to me, I just wish I had people to play it with. I don't, so it's a no-go for me since there is no online multiplayer. Even if I were to buy it, I only have three Wii Remotes .. guess we could play three player. Looks like a simple but fun title. And I love the hilarious style.